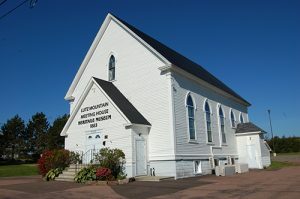 Built in 1883, today’s historic “Lutz Mountain Meeting House”, formerly known as the “Second Baptist Church” of Moncton, now houses the Lutz Mountain Heritage Museum. Artifacts tell as much about people as the written word. Step into the past as you enjoy displays of garments, quilts, household implements, tools, even a school room- proud memories of a bygone era. If you are interested in family research, we have marriage, cemetery and census records from 1770 to 1901, as well as local stories and newspaper clippings. Located just 2 minutes north of Magnetic Hill, take Exit 450 and follow the signs!